The student surpassed the teacher as a new Mr.Olympia was crowned at Orleans Arena tonight in Las Vegas. 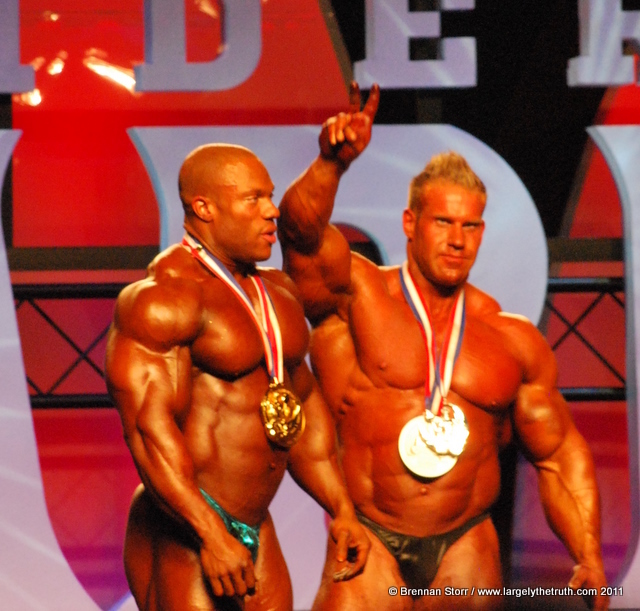 Thirty-one-year-old Phil “The Gift” Heath overthrew friend, mentor and reigning Mr. Olympia Jay Cutler to become the 13th person to hold the coveted title. Finishing third was Kai Greene, the placing a significant improvement over his number seven showing on the Olympia stage in 2010. Also improved was “Dominican Dominator” Victor Martinez who came back from a disappointing 8th place last year to place fourth. Last night at Las Vegas’ Orleans Arena, former Ms. Figure Olympia Nicole Wilkins won back her crown from 2010 winner Erin Stern and in doing so became the first person to hold both Figure International and Figure Olympia in the same calendar year. The final lineup at this year’s Figure Olympia was an all-American affair, with the top six competitors, from Wilkins & runner-up Stern, to Ava Cowen (3rd), Candice Keene (4th), Teresa Anthony (5th) and Alicia Harris (6th) all hailing from the USA. Nicole Nigrani, from the USA, was crowned this year’s Ms. Bikini Olympia tonight at the Orleans Arena in Las Vegas becoming the second person to title in as many years. Inaugural Bikini Olympia winner Sonia Gonzales, also of the USA, dropped back to fifth place this year behind Brazil’s Nathalia Mellow (2nd), and Americans Dianna Dahlgren (3rd), Jamie Baird (4th). Another American, India Paulino rounded out the top six. 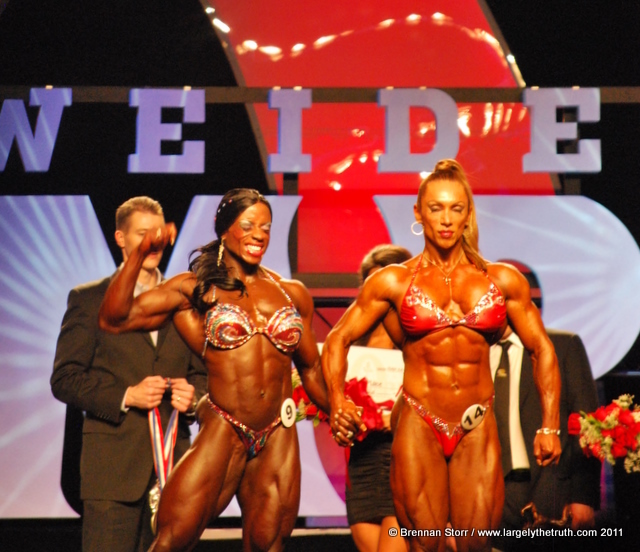 Iris Kyle won her 7th Ms. Olympia crown tonight at the Orleans Arena in Las Vegas, Nevada. Despite being less sharply defined than at this morning’s prejudging, Kyle still managed to edge out runner-up Yaxeni Oriquen-Garcia of Venezuela and in doing so comes one more victory closer to topping Lenda Murray’s record of 8 Ms. Olympia wins. Rounding out the rest of the top six were Brigita Brezovac, of Slovenia, at number 3, Debbie Laszewski, USA, at number 4 and Alina Popa, Switzerland, & Sheila Bleck, USA, holding the 5th & 6th spots respectively. At the end of the pose-down, emcee Bob Chicherillo announced that this would be the last Olympia for competitors Dayana Cadeau & Mah-Ann Mendoza. Mendoza, 52, is a recent survivor of cancer, overcoming both the disease and after effects of chemotherapy in order to qualify for the Olympia. Adele Garcia took first place in the Ms. Fitness Olympia finals tonight at Orleans Area, the sixth time that the American has taken top spot in the contest. Garcia, then Garcia-Friedmansky, first won in 2004, lost to Jen Hendershott the following year before reclaiming the crown in 2006. She’s held the crown since with the exception of a 2008 loss, again to Hendershott. Second place went to Tanji Johnson, third to Myriam Capes, fourth, fifth and sixth to Tina Durkin, Oksana Grishina & Michelle Blank, respectively. Winners: Phil Heath is the New Mr. Olympia!